Boston, MA – April 30, 2018: Hub Entertainment Research released findings today from “What’s TV Worth,” its annual study on the perceived value of TV services. The results reveal a large gap in perceived value between online TV services and traditional cable, satellite, or fiber optic services. The difference between what TV consumers pay, and what they think is reasonable to pay, is greatest among MVPD subscribers. MVPD customers pay, on average, $33 more per month for the TV services they subscribe to than they think is reasonable. However, among those subscribing to Virtual MVPDs like SlingTV, DIRECTV Now, or YouTube TV, the actual vs. reasonable difference is much lower, at just $17. SVODs and virtual MVPDs are all perceived as much better deals than traditional MVPD service. 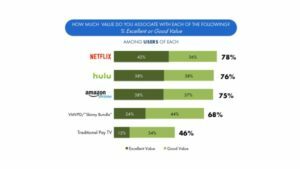 At least 75% of SVOD subs, and 68% of virtual MVPD subscribers, say their subscription is a “good” or “excellent” value. That compares to just 46% among traditional pay TV subscribers. TV Everywhere—authenticated sites and apps from MVPDs or TV networks: A total of 54% of TVE users rate their pay TV service as an excellent or good value. That’s 16 percentage points higher than the perceived value of pay TV among non-TVE users. Netflix Integration: 78% of pay TV subscribers who also have Netflix say integrating Netflix shows and movies into set-top box VOD menus would make their service more valuable than it is today—including 35% saying it would make their subscription a lot more valuable. “What’s TV Worth” was conducted among 2,296 US consumers with broadband, who watch at least 1 hour of TV per week. The data was collected in April 2018. Access the full findings from the study here. Hub Entertainment Research measures and interprets the influence of technology on the ways consumers discover and consume entertainment in today’s rapidly changing media environment. We are experts in our field and work with industry leaders to assess the present and forecast the future. Learn more at Hub.